Sunday morning, we woke up bright and early at around 6:30, ready for a few hours worth of driving to see the state of Missouri. We had a great time the day before exploring Tulsa, but the main focus of our trip was to check-out the Show-Me State. 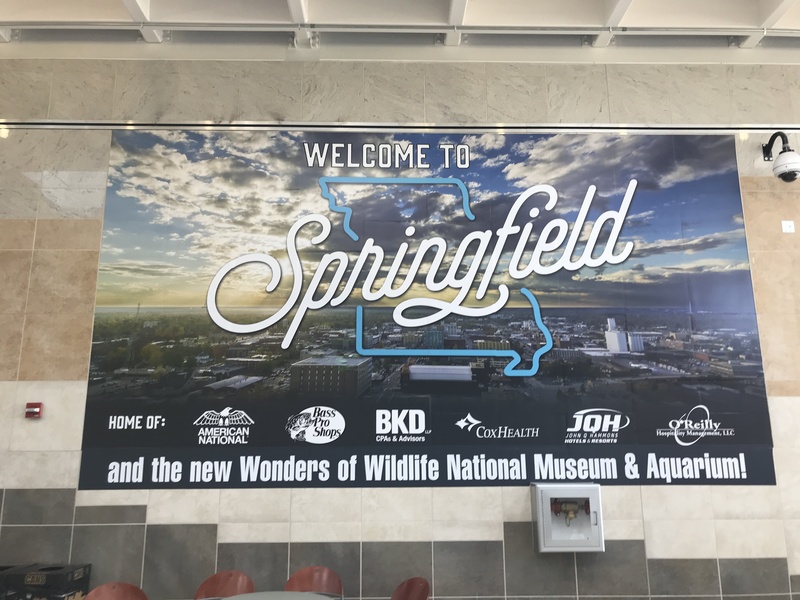 When we were planning this trip, we chose Springfield as the city to visit due to it being sizable, yet not too far from the Oklahoma state line. Situated on the southwestern corner of the state, this place is home to over 167,000 people. Being that it is located in the Ozarks region, the outdoors are a big part of the area. 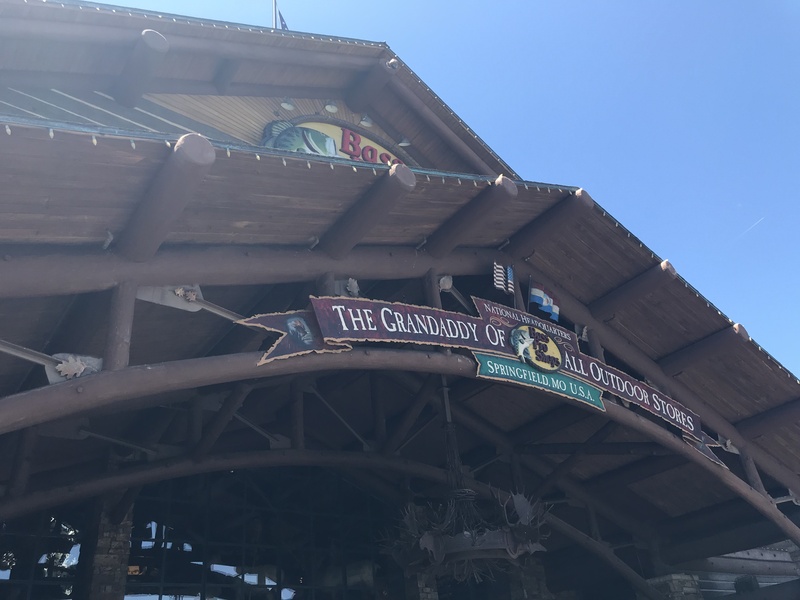 Bass Pro Shops has their headquarters and flagship store here! Once we crossed into Missouri, we were on the outskirts of a town called Joplin. Most famously known as the site of the seventh deadliest tornado in U.S. history, it was definitely a place I wanted to stop and see. First off though, we needed to all stretch our legs, so a pit stop was in order. We went to the Missouri Welcome Center, located right off the freeway at one of the first exits. Compared to many of the roadside rest areas I’ve been to, this one was pretty clean. The restrooms are located in the main building, which(thankfully) was air-conditioned. There were other amenities, including vending machines and even a microwave to heat any leftovers you might have with you. While not present that day, there seemed to be an attendant on-duty normally who could help with driving directions, attractions, and stuff like that. License plates from various states dotted the wall, making it a great background for a photo op, or even just a few minutes worth of gazing at the many different designs. Also, a “Missouri Welcomes You” sign had been erected outside, allowing for photos to be taken without stopping next to the side of the road. Leaving the rest stop, it was about a 5-minute drive on I-44 before exiting again to see Joplin. As we entered the city limits, I could see that many of the houses and buildings were fairly new. The tornado that devastated this town, which happened in May 2011, was an EF-5 rated twister that killed 158 and injured over 1,100. Entire streets were destroyed, with even their regional hospital sustaining major damage. The spirit of the people did not perish, though. We drove thru pretty much the entire city, seeing everything from their downtown area to the many residential neighborhoods. No sign of damage was visible, and there wasn’t any rubble to be seen. In certain areas, there were new houses alongside old ones, while on other streets everything was new. Departing Joplin, we got back on the interstate, bound for Springfield. About an hour and a half later, we entered the city limits. We had a lot to see, but lunch was first and foremost. Fortunately, this town had one of my favorite restaurants: Fazoli’s Italian. A quick-serve Italian place, there were a variety of entrees to choose from, including spaghetti, fettuccine Alfredo, and pizza. Combined with unlimited breadsticks, it made for a solid lunch before an afternoon of exploring. After lunch, it was off to our first attraction – the world’s largest fork. Located on the south side of town outside an office building, it fell into one of those “cool and weird things” that had to be seen, if just for a photo. I wasn’t able to find much history on this unique piece of public art, other than travel website Roadside America telling me that this hunk of metal has been around since 1998. According to them, it used to stand outside a restaurant on the other side of town, until they closed. At that time, it was moved to its present location. It wasn’t located off the main road – we had to drive thru some side streets before reaching it. The office building is home to a food marketing agency – which meant this fork was right at home! 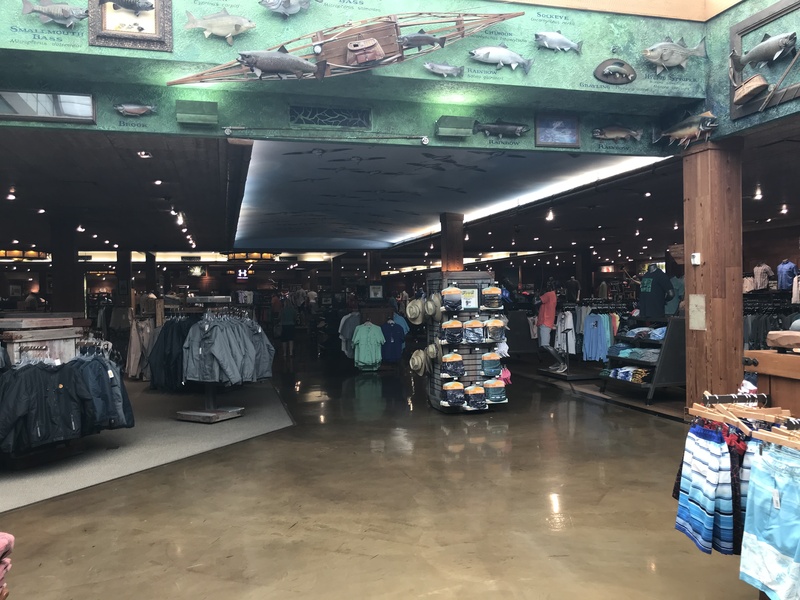 Upon getting done, we headed to our next stop – Bass Pro Shops. Not just any Bass Pro, this one was none other than their flagship location. 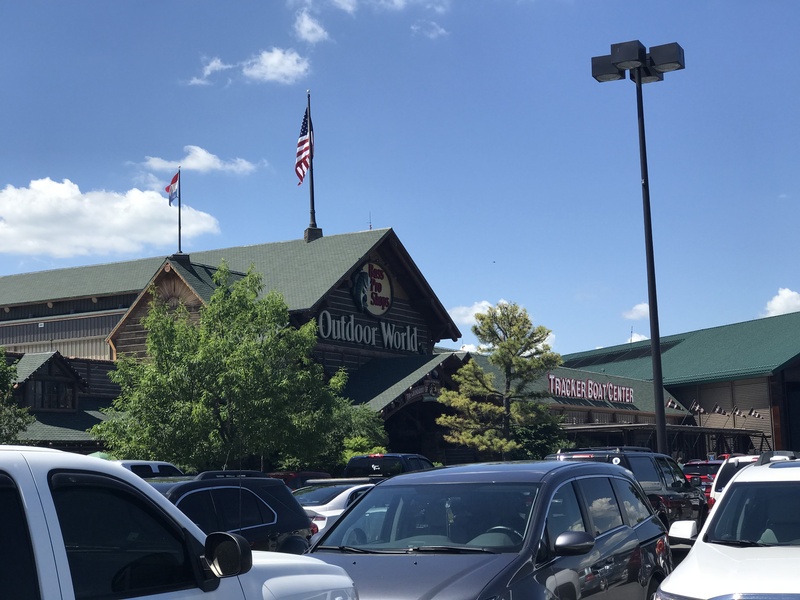 There were three buildings that made up this sprawling complex – the main store, the Johnny Morris’ Wonders of Wildlife National Museum and Aquarium, and the catalog outlet. The headquarters and warehouse of the company aren’t located here though. They are on the other side of town. We checked out the main store. At 500,000 square feet, this could very well be the world’s largest outdoors specialty shop! The Grandaddy of All Outdoor Stores! Being that this was the flagship store, there were tons and tons of merchandise across pretty much every department you could think of. From the numerous rows of boats waiting to be sold to their huge firearms department, almost anything and everything outdoors related could be found here. The men’s clothing section was well stocked, with “mini-stores” for each different major brand. 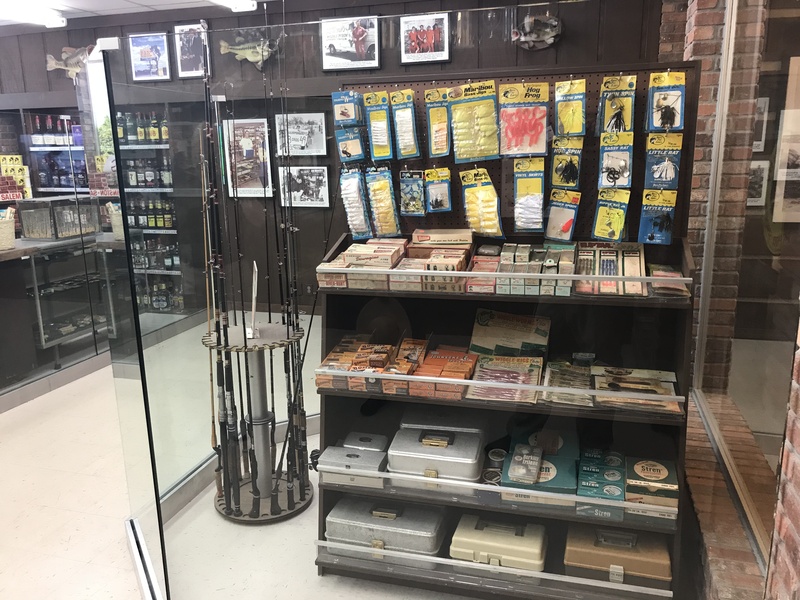 In addition to accessories, their firearms section was well stocked with different brands of handguns, shotguns, and rifles. They even had live animals, including two alligators! 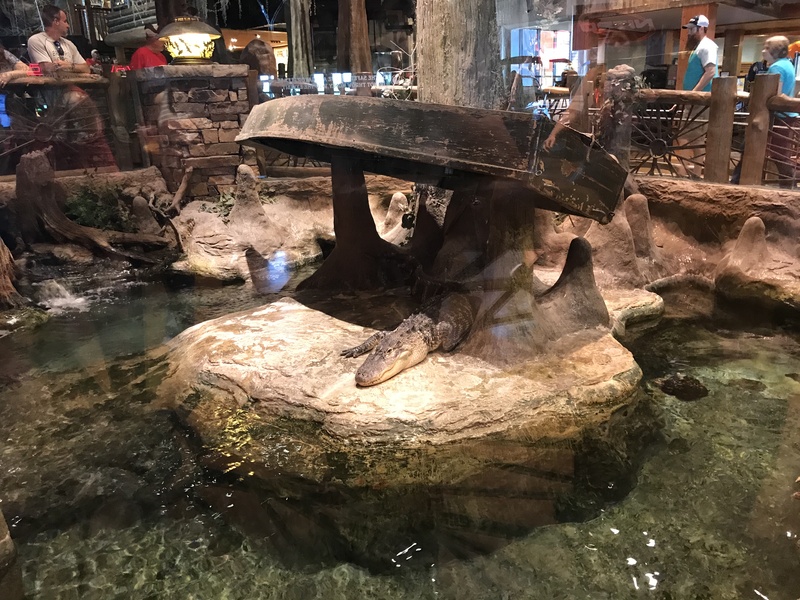 The Bass Pro Shops in Grapevine, Texas has a rattlesnake, but the alligators were way cooler(at least in my opinion). Don’t know their names, but they seemed to be just lazily lying around as people took photos and admired this much-feared creature. Afternoon siesta time for this guy. 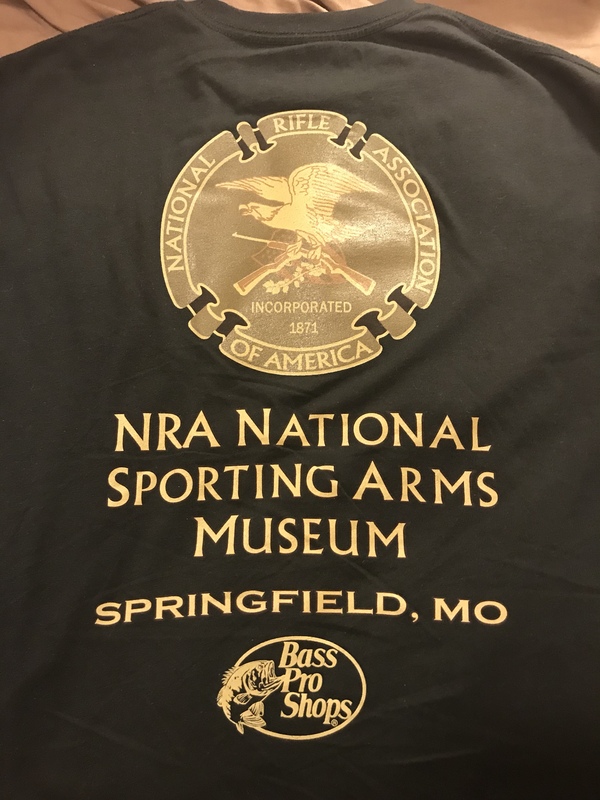 After walking thru the whole sales floor, we went to go see the NRA National Sporting Arms Museum, located just above the firearms department. 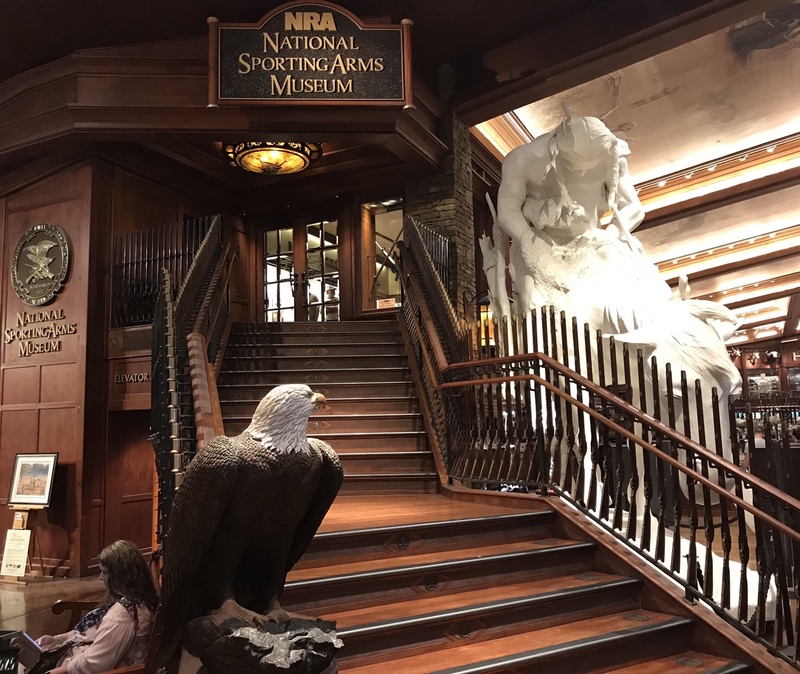 One of two NRA museums, there were tons of both antique and modern firearms. With it being free of charge, this is a must-see, even if you aren’t interested in guns. 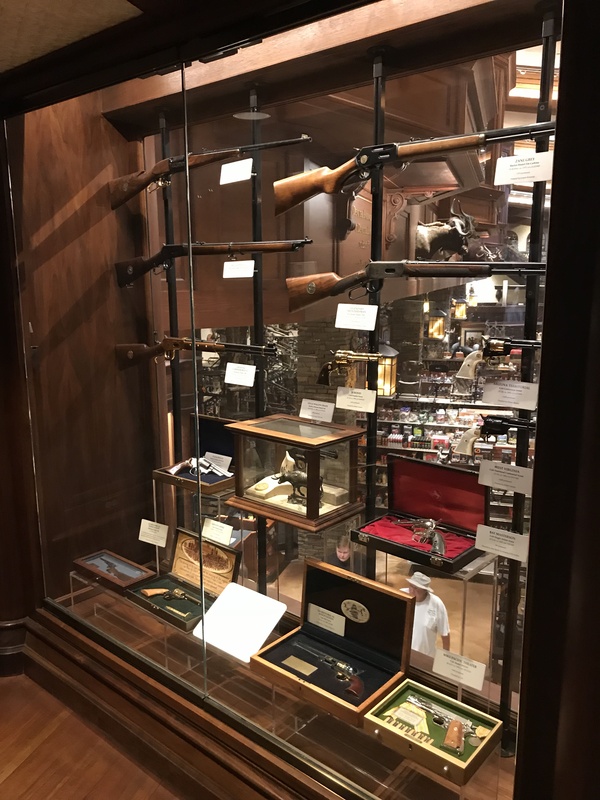 Upon entering, both sides of the wall had glass display cases that exhibited various firearms, starting with rifles dating back to the 19th century. Displays upon displays of nothing but different guns, along with an explanation of their significance in history. There were so many unique guns that I had not seen before. This rifle actually had a radio inside it, so you could jam out to Willie Nelson as you went about your hunt! 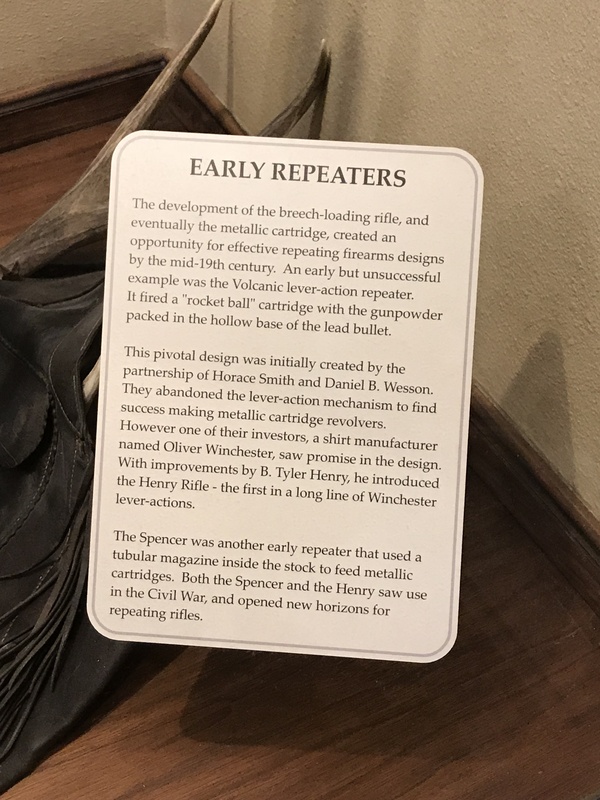 A Winchester rifle with a radio built into the buttstock. Talk about advanced! Detailed explanations were provided for each gun, almost a little bit too detailed in fact. Any gun lover like myself could have spent an hour easily in here. For those that aren’t as familiar with firearms, there were docents walking around that were available to answer questions. Just when I thought I had reached the end of the museum, I saw a stairway going up to another floor! Upstairs, a room contained an exhibit about President Theodore Roosevelt and his love for the outdoors. 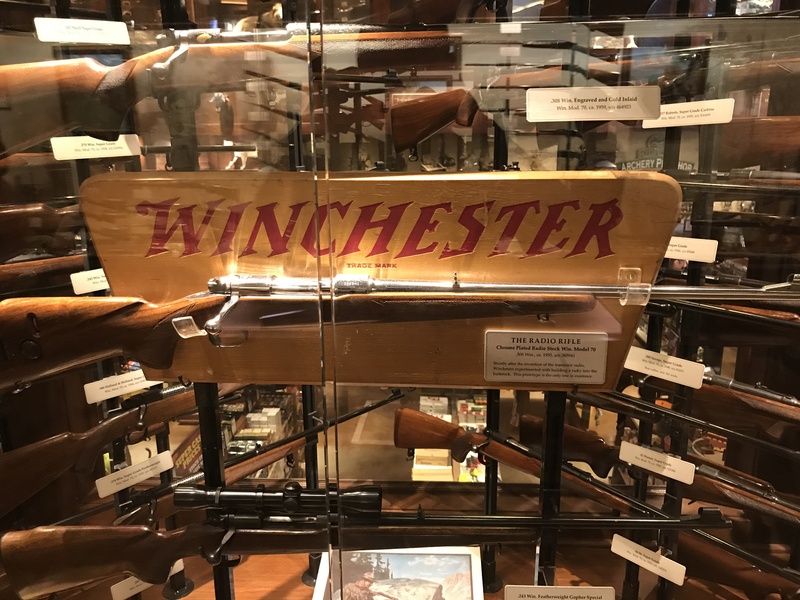 Firearms used by folks in that era were displayed, and there was even a nice diorama that puts the visitor back in the days of the late 1800s. 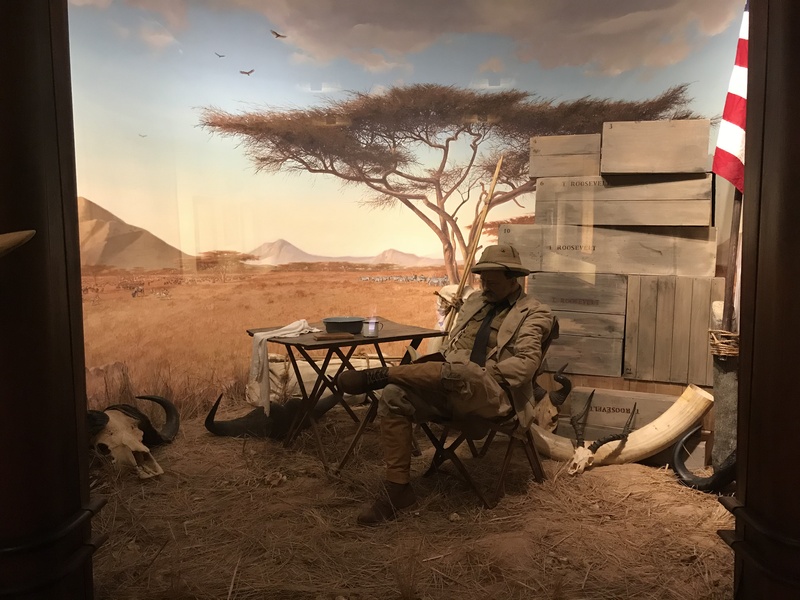 The diorama exhibited upstairs, showing Teddy Roosevelt on the frontier. Leaving the NRA museum, we finished up the rest of the first floor of the store. Stopping by the t-shirt aisle, I knew I had to snag something. Not even five minutes later, I had found a design I liked that wasn’t just a generic Bass Pro t-shirt. I wanted something that had the city name on it, as well as some significance to what I saw here. From there, we headed to the second floor. I thought there would just be more merchandise for sale, but I was pleasantly surprised. In addition to the ticket sales counter for the aquarium, there were two more free mini-museums. 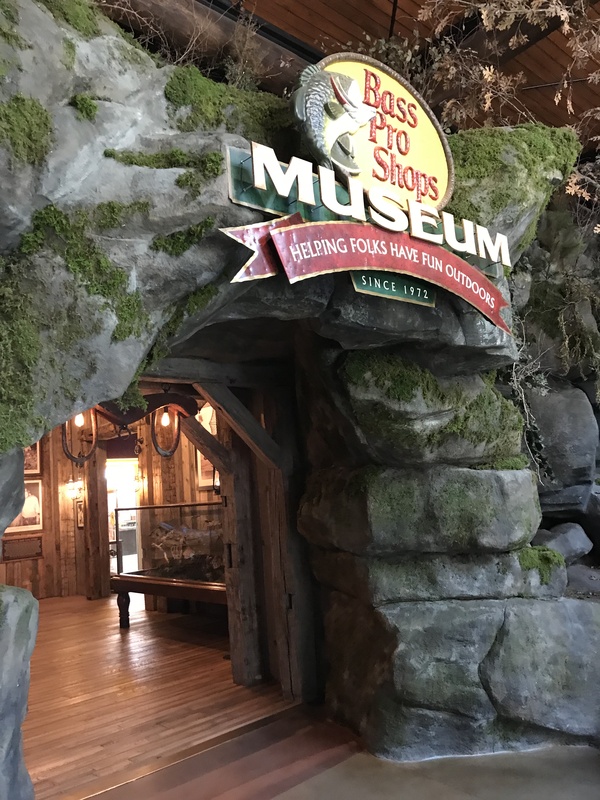 The first one, the Bass Pro Shops Museum, went over the history of the company. Everything from how they got started, to in-house brands were discussed. Entrance to the company museum. One of the coolest exhibits there was a replica of the original store. 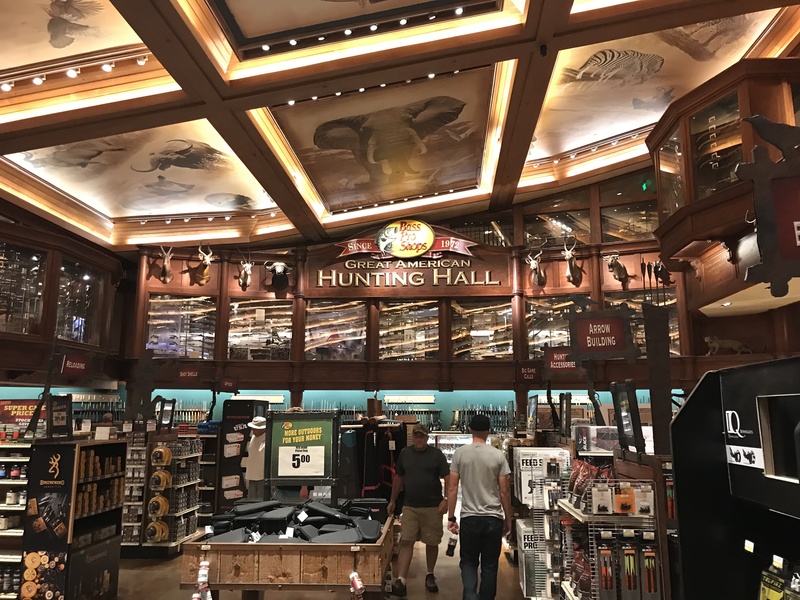 Believe it or not, Bass Pro wasn’t always a gigantic place selling everything under the sun when it came to sporting goods. 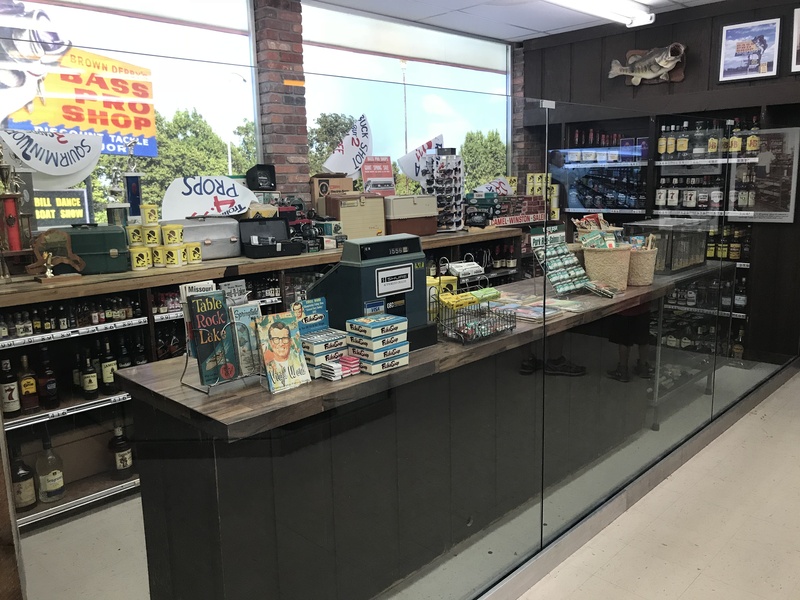 Founder Johnny Morris started the business in the back of his dad’s liquor store right here in Springfield, back in 1972. Selling fishing tackle and other supplies, the business quickly grew. Pretty cool to think that the Bass Pro we know of today started here! 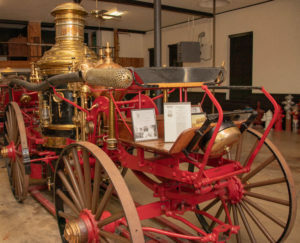 The cash register, front entranceway doors, and many other artifacts displayed here were all original to the store that started it all. Standing there, it was easy to see how this was a prime example of the American dream. Everyone successful started somewhere, and with hard work, it is very possible to go from operating out of a small store or garage to being one of the biggest companies in the industry. 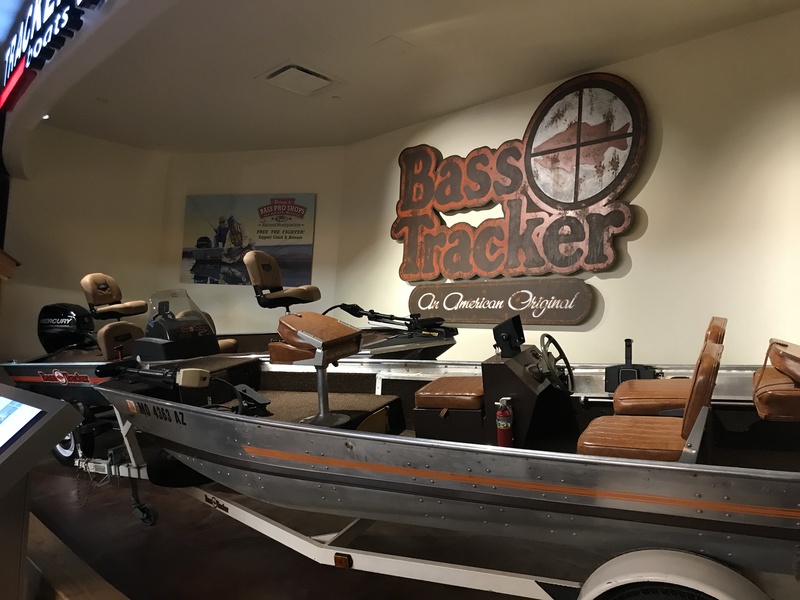 Another topic exhibited was Tracker Boats, their in-house brand of fishing boats. Johnny wanted to have a line of boats that any average American family could afford, much like Henry Ford and his Model T automobile. The brand took off and is now the leading brand of fishing boats in the country. 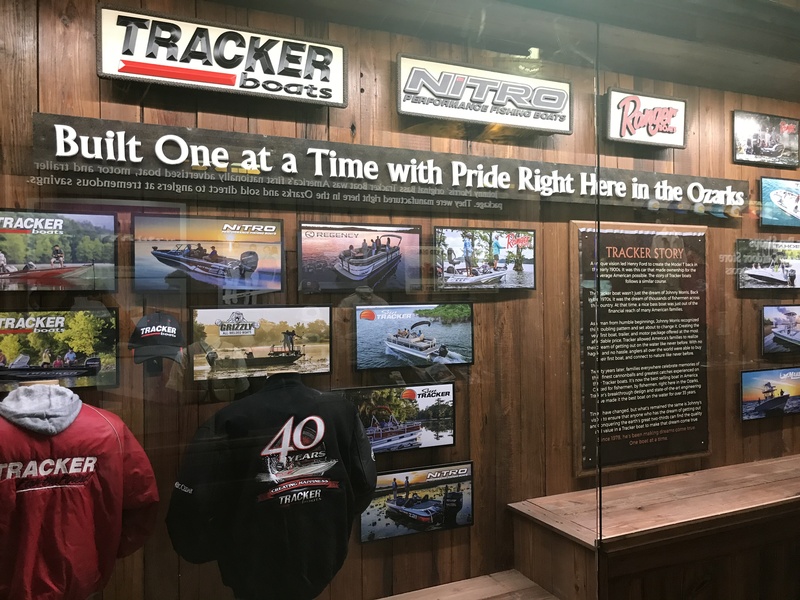 I had no idea that Tracker boats were that popular! The explanations, combined with pictures in this exhibit, made it easy to understand for someone that doesn’t know much about boats, like me. As we left the company museum, we swung by the other mini-museum, which talked about Bass Pro’s NASCAR endorsements. There were a few race cars exhibited and in my opinion, is a must-see for any NASCAR fan. The family and I didn’t spend much time in there since we aren’t into racing at all, but nevertheless, this collection was something that isn’t seen every day. By then, it was about time to get going to our next point of interest. This was a cool stop! After a brief drink stop at McDonald’s, we headed for Missouri State University. Founded in 1905 with just 543 students, the university began life as a normal school, which trained students to become teachers. After four name changes, and tons of growth, the school adopted its present name. With an enrollment of over 26,000 across four locations, it is the second largest university in the state. Springfield is home to the main campus, with over 24,000 students studying here. First driving around campus, I noticed that many of the buildings were pretty new. After circling around for about 10 minutes, it was time to park the car and do some walking to see the heart of Boomer Bear country. 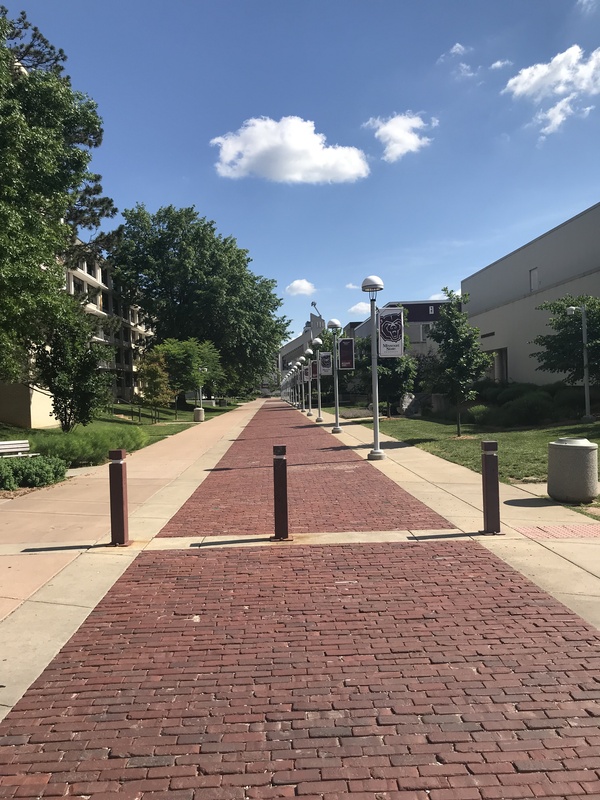 Being that it was a Sunday on Memorial Day weekend, I expected the campus to be completely dead. To my surprise, there were a few people lingering around the residence hall areas, seemingly moving in/out. Additionally, a few international students were wandering around. Seeing people gave me hope that the buildings might be open for exploration. 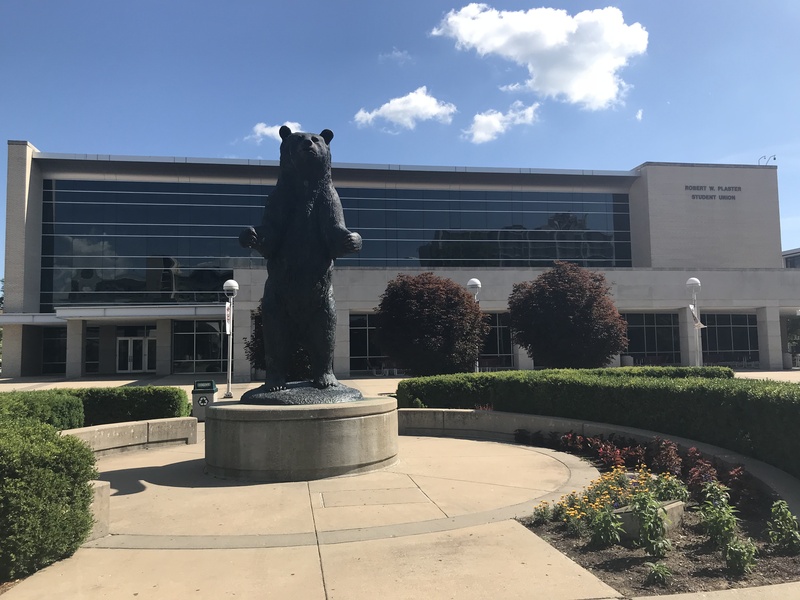 The first thing I wanted to see was the Boomer Bear statue, right in front of the student union, in what could be considered the center of the school. The statue, representing the school mascot, was put up in 1999. Boomer the Bear, standing in front of the student union. After checking Boomer out, I wanted to see if we could enter the student union to look around. The doors were locked, but I was able to peer in. Their student union kind of reminded me of the one at Stephen F. Austin State University, back home in Texas. There were a few restaurants and plentiful amounts of space to spread out. From there, it was off to go see the library! The campus was nice and clean. 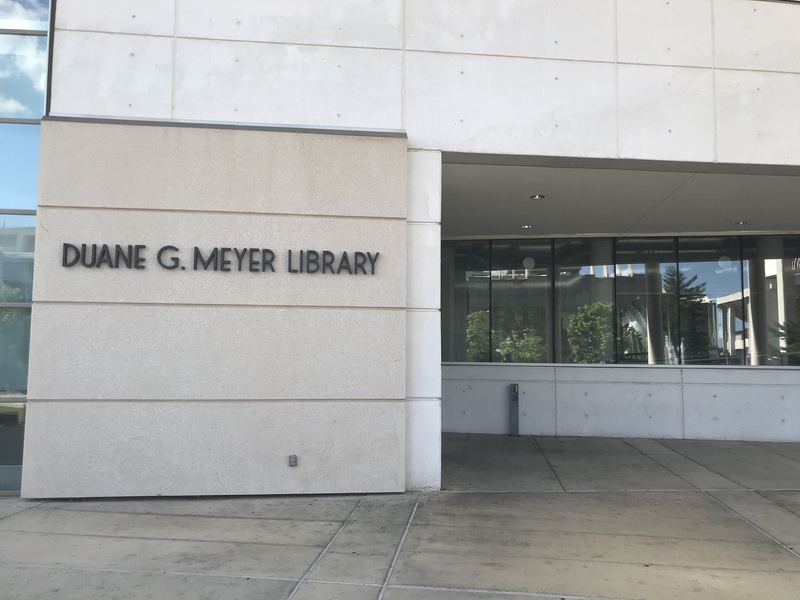 Located on the other side of campus, the library was about a five-minute walk from the student union, close to the football stadium. When we got there, the first set of doors were unlocked, and we walked in. Unfortunately, the second set was locked, and a sign said that the library was closed Sunday and Monday. Standing in between the entrances, we were able to get some much-needed relief from the sweltering heat outside, due to the area being air-conditioned. Looking in, it seemed fairly modern. As I recall, there was a whole area in the lobby with cubicles, sofas, whiteboards, and tables. It seemed to make for a great place to meet up for group projects, or to just get some studying in. Departing the library, we left Missouri State and headed for downtown Springfield. Being that I didn’t really know where the actual downtown area was, I had Apple Maps direct me to the Springfield Police Department, since the police station is usually located in the heart of town. When we arrived though, the buildings in the vicinity just didn’t resemble what most people would think of as a downtown area. They didn’t appear to be aged, not to mention the lack of an old-town charm. Determined to find the roots of Springfield, we then drove back in the direction of Missouri State, where we had seen one to two tall buildings earlier. After around 10 minutes, we finally came upon downtown. Although we had passed by the edge of it when exploring the school, it didn’t strike me as being that close. Consisting of a mixture of both new and older, historic buildings, their downtown was fairly quiet but nice. On one street, there were a number of restaurants and shops open. 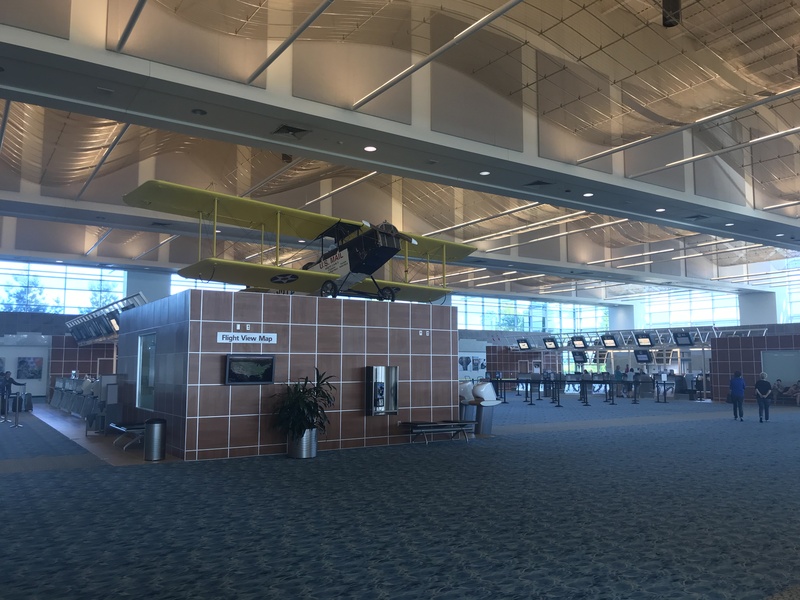 We drove around exploring their downtown area for around fifteen minutes, and then headed for our last stop – the Springfield-Branson National Airport. We had seen the sign on I-44 pointing out the exit for it as we drove in this morning. Upon entering, we started looking for the free parking. Unfortunately, there was none. However, the rates at the short-term parking lot weren’t too pricey. If we stayed 30 minutes or less, we only had to pay $2, so we decided to park and make this fast. 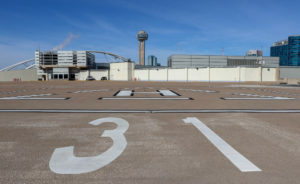 Their sole main airline terminal was around a thirty-second walk away from the lot. When we entered, the first thing I noticed was how new and clean it was. While this airport isn’t busy like Dallas Love Field or Houston Intercontinental, there were people coming and going all throughout our visit. 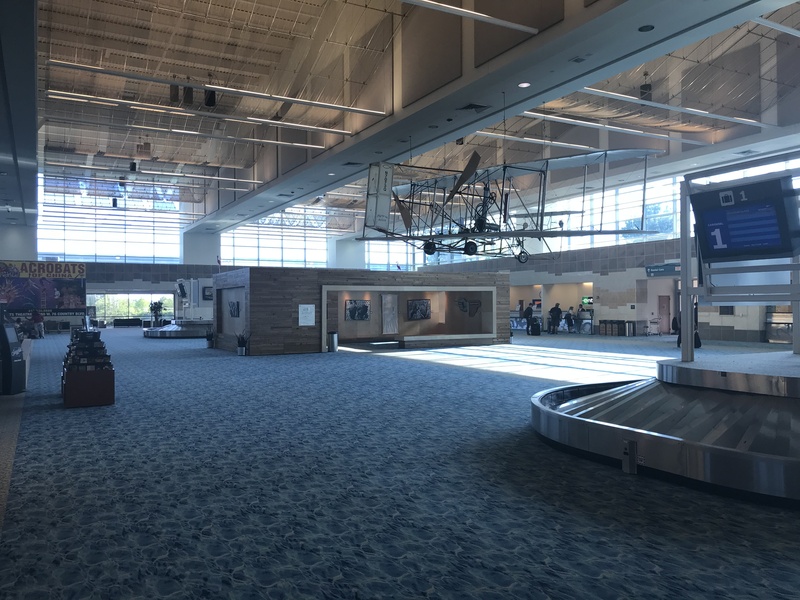 Allegiant, American, Delta, and United service this airport with a combined total of eleven destinations. Something I liked about here was that everything is housed under one roof- no need to take a shuttle bus or tram! The rental car counter was located right behind the baggage claim area, and a visitor center had many brochures, maps, and hotel information available for people to take. Several convenience stores allowed travelers (or the folks picking them up) to get drinks and other necessities. They were closed though when we were there. One can get their bags, grab their rental car, and obtain information on local attractions without leaving the terminal. Something that can’t be done at DFW. When it came to decor, this airport got both thumbs up from me. In addition to a mini public art gallery by the bag claim area, there were two airplanes hanging from the ceiling on display. They immediately drew my attention as I walked in. 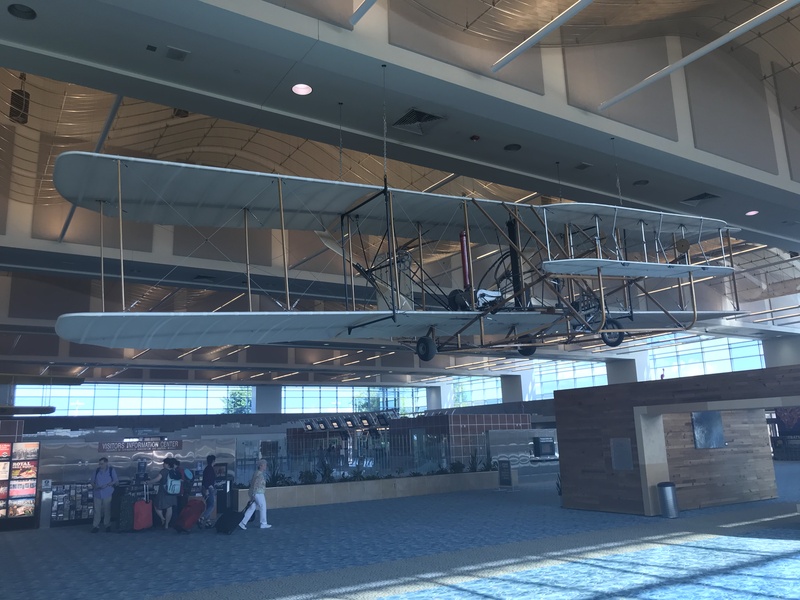 One of them was a replica of the Wright Flyer, the first airplane in the world. A replica of the Wright Flyer. A nice display in a nice airport! The other one was a vintage biplane used to carry mail back in the early days. Down the hallway from the security screening area was an old airport fire department Jeep. Not sure as to its age, but I would reasonably guess it is over 50 years old. Displays like these help make the airport experience more interesting for travelers, and give both the young and old alike something neat to see to pass the time. For those not interested in aviation, there was also a pretty nice meditation room next to the security checkpoint. It contained chairs and was dimly lit – perfect for finding your inner Zen prior to getting stuffed in a cramped cabin bound for Chicago. 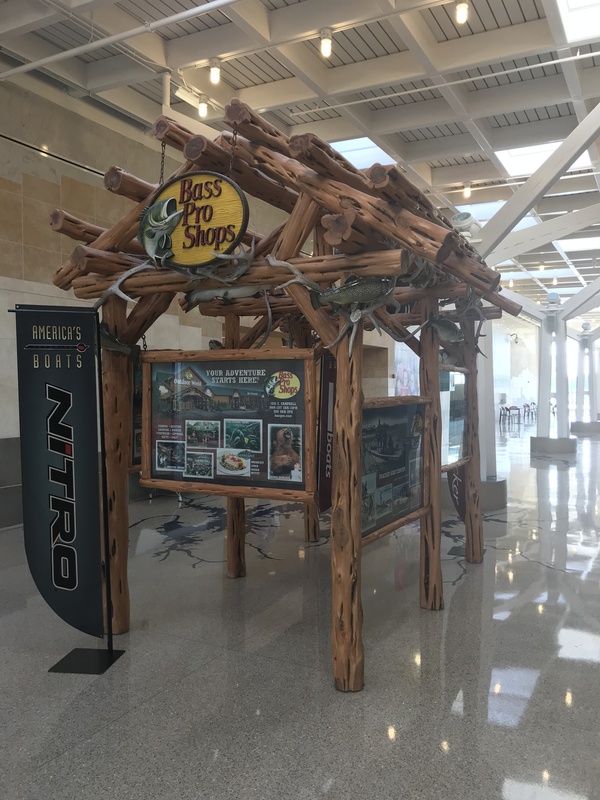 A Bass Pro advertisement by the security checkpoint. The design of the floor tiles map out the shapes of area lakes. Before long, it was time to get going, so that we wouldn’t be charged for the next tier of parking time. After leaving the airport, we headed for dinner at Panera Bread, one of the places that works great for vegetarians like us. This place was unique in that the restaurant was connected to a branch of the Springfield-Greene County Library, located next door! Although the library was closed, it looked like a nice place for people to borrow some books and grab some coffee. Once dinner was done, it was back to the hotel for some much-needed R&R. We departed for Dallas bright and early the next morning, since we had to pick up our family dog before PetSmart closed at six. Departing Springfield, we took the same route that we came in on. After crossing the Oklahoma state line, the highway once again became a toll road. We exited in the tiny town of Big Cabin, where we then connected onto Highway 69 (which became U.S. 75) back to Texas. The road conditions on the way back weren’t bad, however portions of 69 were local roads, resulting in stop and go traffic at times. However, we still made good time and arrived ahead of schedule! In conclusion, for my first time in Missouri, it couldn’t have worked out any better. We got to see all the places we had planned to visit, and the weather cooperated in our favor. Although this trip entailed tons of driving, seeing Springfield, Joplin, and the vast scenery that comprised the Show-Me State made it all worthwhile! Beautiful & intelligent reporting! You need your own show!!!! I’d definitely watch!